HONG KONG, Jan 2, 2019 - (ACN Newswire) - Blockpass continues to provide fast, seamless and simple customer onboarding and verification as it announces a new integration with Korporatio. Improving the KYC process will enable Korporatio to focus on its mission of revolutionising the corporate legal form with blockchain technology and creating an ecosystem of decentralised blockchain-enabled legal entities. Through this integration, Blockpass and Korporatio provide a regulatory-compliant solution to facilitate the next generation of businesses. Korporatio is introducing the idea of a Smart Company - a globally-connected and blockchain-compatible company with its own legal identity provided by Korporatio. In providing this service, Korporatio will create legally recognised trading entities which can own assets, capital and employ people. Using smart contracts and blockchain technology, Korporatio will change the way that businesses start up and operate by removing bureaucracy and red tape that prevents progress. Through its integration of Blockpass' KYC verification process into its proprietary platform, Korporatio will be able to offer seamless and compliant user onboarding for new users. To celebrate the partnership, Korporatio will offer 40 free PASS Tokens for companies who incorporate using Blockpass seamless verification service, KYC Connect and for one-week only a 20% discount for Korporatio's services when customers on-board using the Blockpass KYC option. For company registration via Blockpass KYC services made between 2nd of January to 9th of January users will receive a 20% discount on Korporatio services. Korporatio joins a growing number of companies to enjoy Blockpass' quick and easy KYC compliance solution which is increasingly being employed by Blockchain companies such as Infinito, GoSecurity and DSTOQ. Companies such as these, as well as Korporatio, are using blockchain technology to create global solutions in a tokenised and efficient economy. To quote Stefano Covolan, founder of Korporatio: "It is amazing to have Blockpass on our side. Our goal to make Smart Company incorporation effortless is becoming more and more of a reality. Thanks to this partnership Korporatio users will be able to remove another human touch point during the incorporation process. We always emphasize how the community is the central point of our work, and I believe this collaboration shows exactly this!" 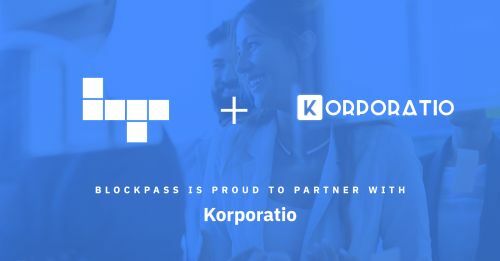 Adam Vaziri, CEO of Blockpass, said: "We are excited to partner with Korporatio in their efforts to improve the experience of starting and running a business. At Blockpass we are dedicated to providing identity solutions and as we are developing a company identity solution to compliment our human identity verification solution we hope to continue to work closely with Korporatio as we progress. The future of business and commerce is through blockchain ecosystems and we are proud to contribute to furthering this goal." Korporatio is the first company in the world to enable fully legal Smart Companies (SC) through Blockchain technology on Ethereum. With its legal framework being complaint by Republic of Seychelles, a Smart Company is a hybrid of real-world International Business Company (IBC) and Decentralized Autonomous Organization (DAO), providing a method to transfer ownership and liabilities over real-world assets with actual value, enabling significant gains in speed, technical resilience and costs - and therefore a foundation to entirely different business models through a decentralized ecosystem.